My teenage nephew loves it when I make him tacos for lunch. 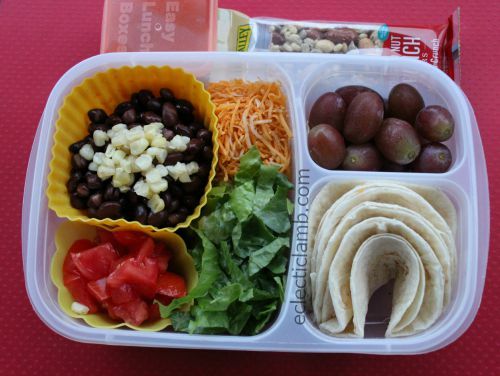 Sending tacos for lunch can be a fun change from other lunch food. 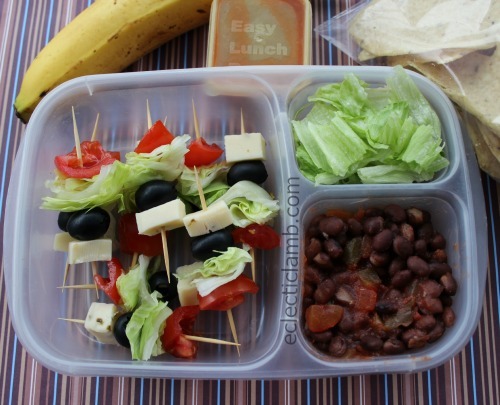 You are only limited by what you or your kid will eat. 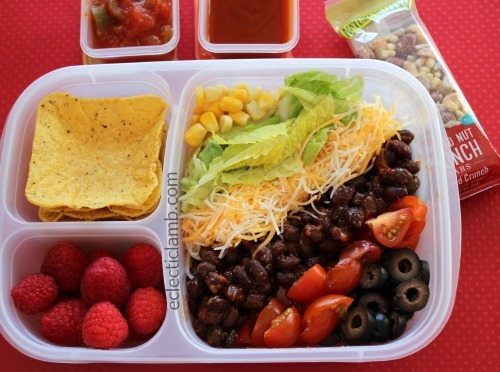 Here are 12 meatless taco lunches. All of these were packed in my EasyLunchBoxes. The mini corn tortilla cups were an experiment and my nephew said not to make them again so I will not bother giving you the recipe. 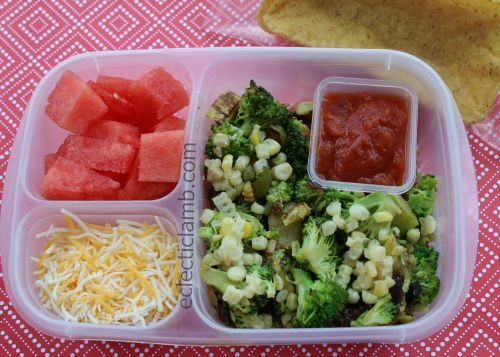 This is a roasted and sauteed vegetable taco lunch served with Ortega Fiesta Flats. I was not expecting to make a taco lunch and did not have lettuce in the house. My nephew decided to have a taco without lettuce instead of eating something else. I like how this one turned out. It was convenient that the Ortega Mini Fiesta Flats fit in the box. But I can no longer find them. Also my nephew had said that he wished that he had more of the shells then I sent that day. 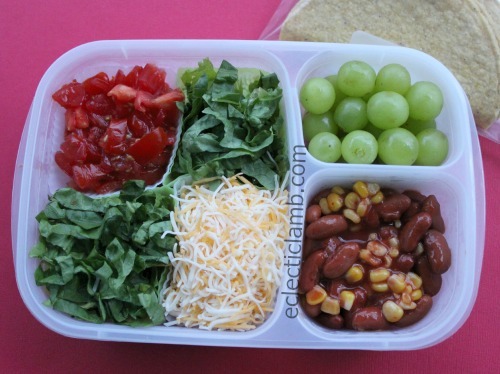 For this one I cooked the beans the night before but assembled the lunch in the morning before school. The shells are mini taco shells and I can no longer find them. The previously published post is here. 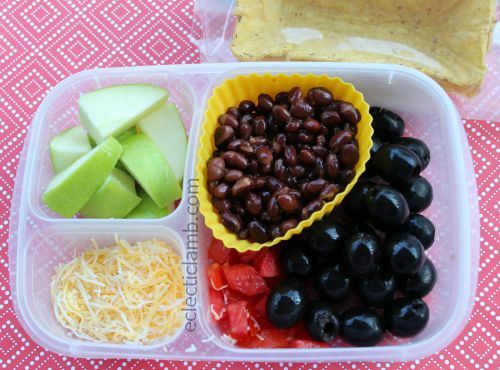 I made this one with kidney beans instead of black beans. This original lunch post is here. I had fun with this one. While brainstorming different ways to serve the same thing, a younger nephew said, “Taco on a Stick”. This Taco on a Stick lunch was previously published here. 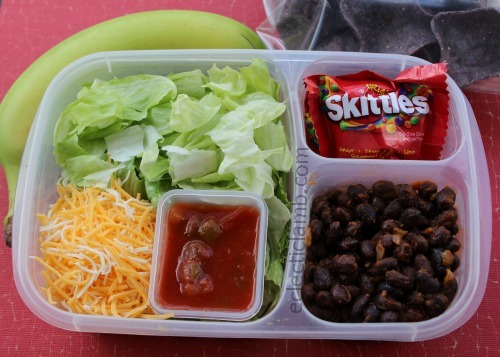 My nephew loves Skittles so it was the special treat in this lunch. 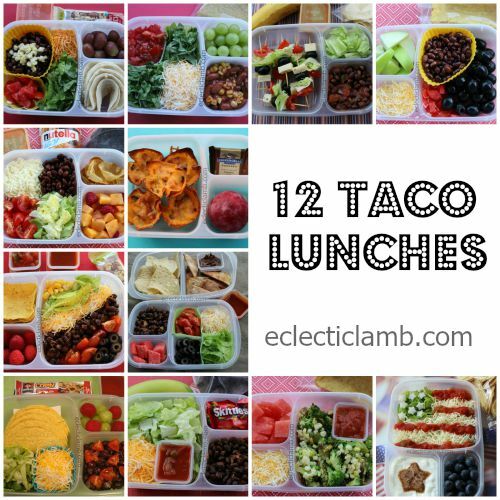 When I send taco lunches to school with my nephew I try to make them different. 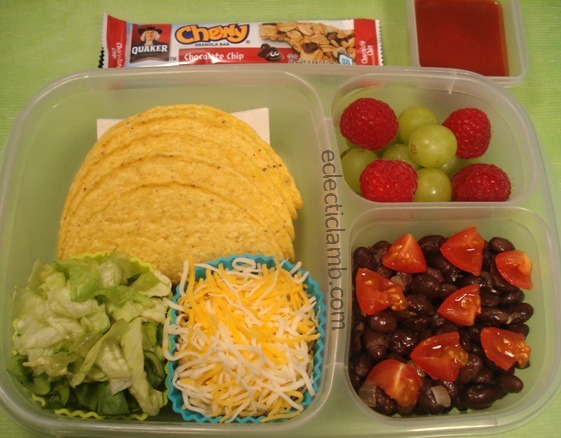 For this one I put the tortilla chips in a plastic container instead of plastic bags. I also made cinnamon sugar chips and served with Nutella as a special treat. My nephew ate this for dinner at my house. I think that the black beans (hidden under the other ingredients), Greek yogurt, and chips made this a filling meal. 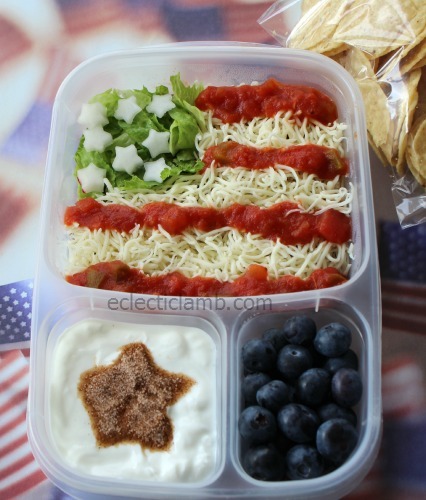 This Taco Salad Flag lunch was previously published here. My nephew prefers hard corn shell tacos but for this one I sent soft flour tortillas. 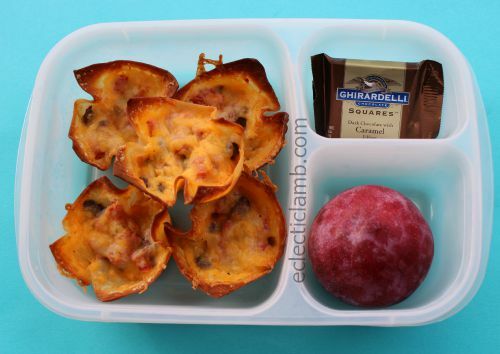 These taco cups are best eaten hot out of the oven but I did pack some leftovers for lunch. The bottoms were a little soggy but the rest of it was crisp. 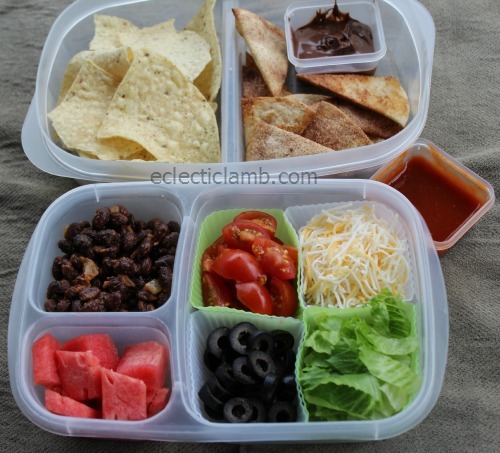 I hope that collection gave you some ideas to make lunch more fun for your teen or someone else special in your life. 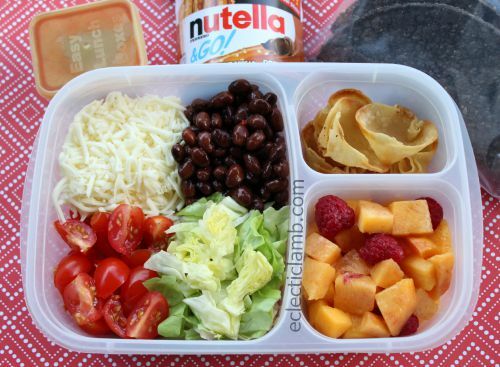 This entry was posted in Bento / Cute Food, Food and tagged taco. Bookmark the permalink.